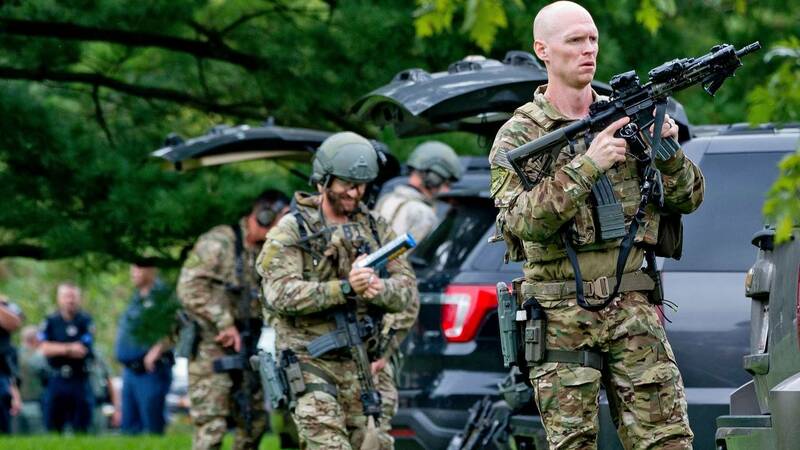 FBI tactical agents stand ready to assist as police search for a shooter Thursday. (CNN) - A woman who shot three people dead at a Rite Aid distribution center in Maryland was a disgruntled employee who had been working there for less than two weeks, authorities said. Snochia Moseley, 26, opened fire Thursday at the facility near Aberdeen -- the second workplace rampage in the United States in 24 hours. "There's just no way to make sense of something that's so senseless," Harford County Sheriff Jeff Gahler said Friday, adding that the motive remains unclear. Gahler said she went home at one point and returned later with a handgun, pepper spray and a pair of handcuffs. She began shooting during break time as some employees headed outside, Gahler said. About 65 workers were in the warehouse at the time. the sheriff's office said. Moseley opened fire outside the building and on the warehouse floor. The first victim was shot outside and five others inside the warehouse. She then fatally shot herself in the head with the same 9 mm Glock pistol, Gahler said. Deputies were dispatched at 9:09 a.m., he said. Within five minutes, he said, deputies were at the scene, along with the FBI, state police, first responders and other law enforcement authorities. In a statement, Rite Aid said the distribution center has been closed and grief counselors were made available to employees. "Our thoughts and prayers go out to all those involved in this tragic incident, as well as their loved ones." When the gunfire erupted, Alexie Scharmann got a series of text messages from her mother, who works at the facility. Scharmann's mother survived and sent her the text message she had been hoping for at 10:33 a.m.
Colleen Hendrickson, who lives and works in the area, was waiting for a bus when the shooting started. A co-worker injured three people when he opened fire Wednesday at an office complex in Middleton, Wisconsin. Later that day, a gunman wounded four people in Masontown, Pennsylvania. Police killed the shooters in both cases Wednesday.